Wabi-Sabi, that’s a fun one to say too! While innocently shopping at a the Yarn Bank in Taylors Falls, MN where I didn’t really intend to buy much of anything I found this cool pattern and yarn. It’s cotton but it feels like linen or paper while you’re knitting with it. It’s kind of an odd feeling to knit with this, yet fun as well. It feels very fragile (although I can say without a doubt that it is not). I can’t wait to see how the yarn will bloom and change when I block it. The photo on the pattern looks like a completely different yarn even though this is the yarn that is called for. The scarf is very slowly growing into a long triangle shape. I say slowly both due to the shape and due to the lack of knitting that has been happening. My friend, Maryanne, convinced (ok she didn’t have to twist my arm too hard!) me to join her in the Camp Loopy 2014 this year. It’s a virtual camp that takes place over June, July and August. You are given a theme for each month and need to complete a project related to that theme before the 1st of the next month. The first theme is based on our favorite book, movie or TV show and needs to be 400 yds. I chose Harry Potter (which narrowly won out over Game of Thrones) because I found this fantastic Sprout colorway and the Trieste cardigan. It’s my first real steeking experience. Although on the surface it doesn’t look very magical, I can just imagine the vine twisting out from the cardigan to tie someone up. Or the Wholloping Willow branches picking up a car to toss as far as it can. Plus, it reminds me of my college days spent in the greenhouse above the Biology department grafting potato plants. I think I would have gotten along very well with Professor Sprout and the students in Hufflepuff. It’s funny how the next project is always the best project. What I mean is while I’m working on the current project most of the time I’m dreaming about the next project down the line. What’s it going to look like, what yarn I’ll use, whether I need to go buy more yarn or if I have it in the stash, do I have the needles I need…. and the list goes on. 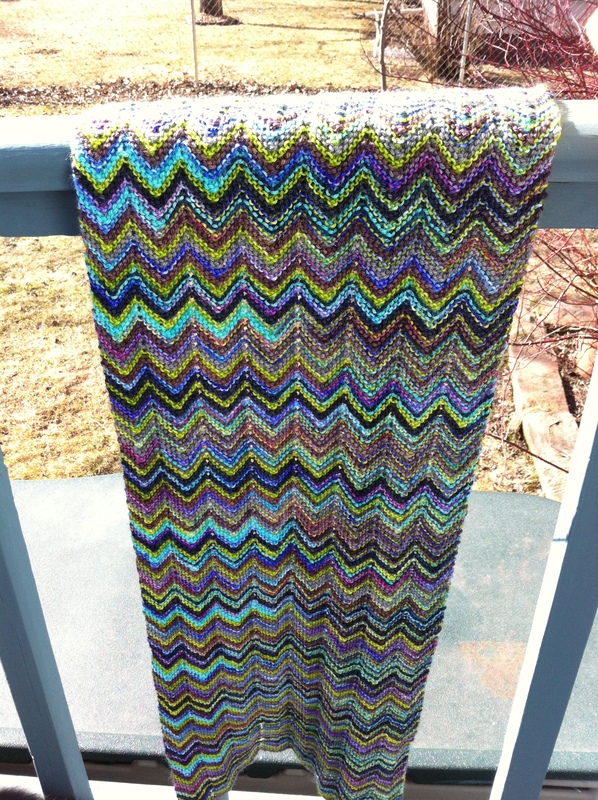 So it should be no surprise to me that when I was working on my first Smitten Scarf I was planning the next one. I took a two day break…. it was a hard two days! Once I got over the shakes I was much better. After the two days, I found a hat to knit that was done with worsted weight yarn to see if that would help. I even crocheted a bit thinking that would help as you move the muscles differently. It all helped a little. I was able to power through the blue scarf. I’m donating it to a silent auction for a friend who is paddling in Dragon Boat World competition. 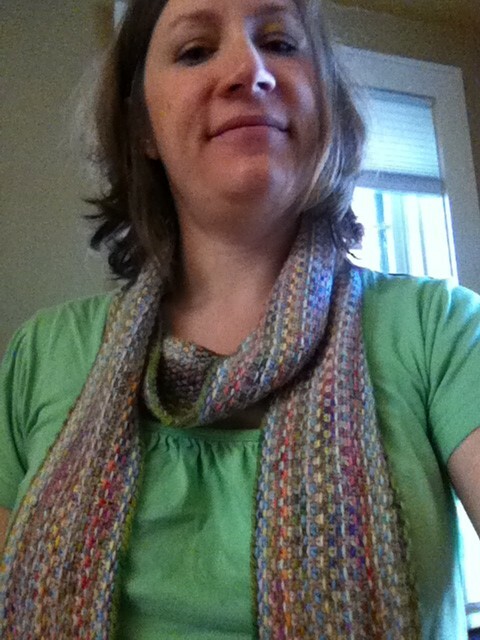 It’s a bit brighter than something I would normally knit – I really struggled with the color combinations. I finally decided that what I didn’t like about the scarf was that it didn’t go with black or grey (the color of pants that I seem to wear a lot of). When I held the scarf up against a blue or green background it looked great. It really pops against denim. Last night I tossed the stash a bit and decided that I really have some lovely handspun from Sharon that I should use before the Second Coming. I was searching for something simple and mostly brainless that would make the most of 2 skeins of 210 yds each. Then it hit me, I have a lovely kit for a Bias Shawl from HPKY that a bought a while back. It’s soft, it’s fluffy, it feels too light and airy to be real. And, it’s warm. Which normally is not something I would want at the end of June. But since this is not a normal year, I need warmth! 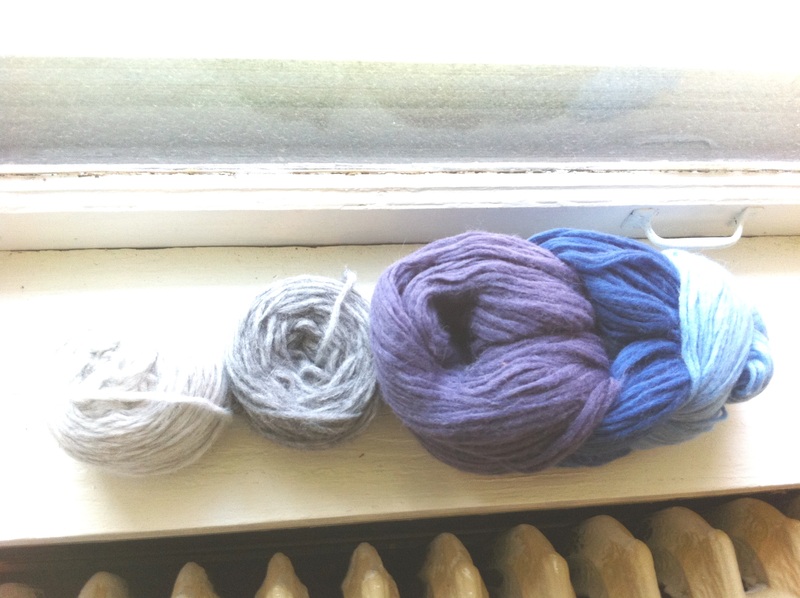 In the meantime, I’ll keep looking for the perfect project for my handspun. The grass outside my window is actually turning green and my husband is starting to work on outside projects. I’m very excited as we are doing extensive yard projects this year. It’s not quite a total yard makeover, but it will be close. We’re moving the garden to a sunnier spot as the trees around our old garden have gotten much bigger and leafier since we planted it. We’re putting in a retaining wall type of planter along the south side of the house, and we’re putting in a backyard patio. I say “we” but really all I’ve done is consult on the correct color of block and pavers. I’ll do the majority of the planting or replanting. And of course the purchasing of new plants. The nights have still been really cold, so I’m hesitant to buy or plant much right now. As for my knitting, welllll… I am knitting. I’m in the 2nd section of the Cameo shawl. I’m anxious for the final section,which is lace. I spent the Memorial Day weekend driving down to Chicago and back (a trip that I would normally be a passenger on most if not all of the trip) so I didn’t get to knit as much as I would like. 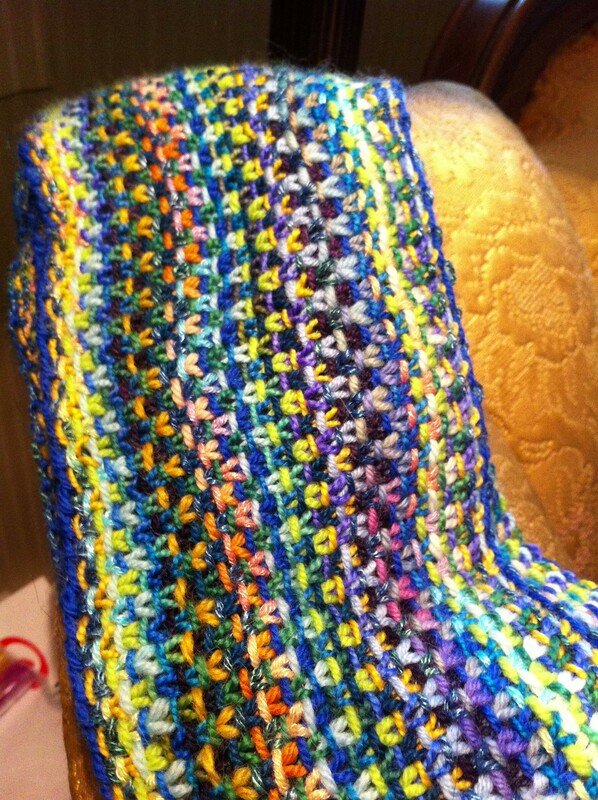 I did get to work a little on a crocheted blanket for my nephew while I was there. 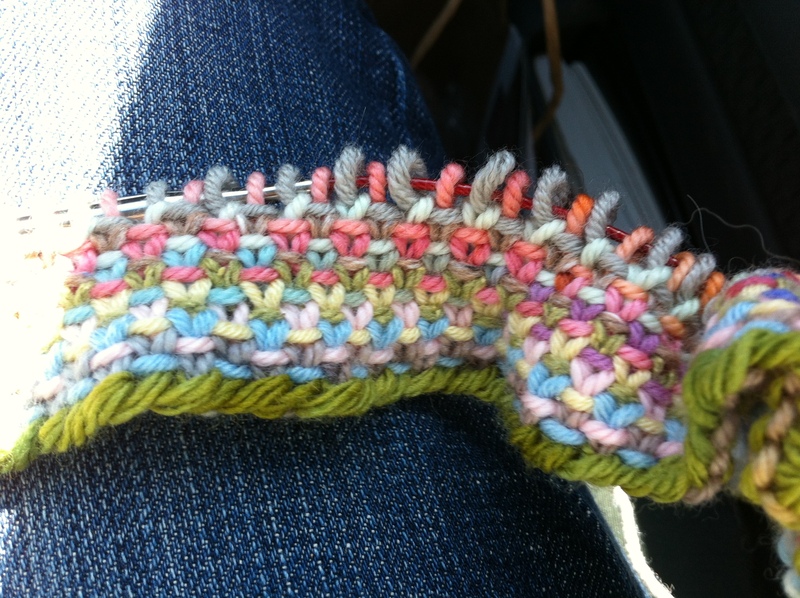 The up side to driving all that way was that I was able to catch up on my knitting podcasts while in the car. The girls got a little tired of listening to knitting though so we mixed it up with They Might Be Giants on the way home. This weekend I realized too late that I had left my knitting at the office hiding under my desk. I pulled out a kit for a Mini Mania scarf. Oh. My. I am smitten!! I don’t know what it is about this scarf, whether it’s the colors or changing yarn every row, but I totally and completely love it. I’m planning my next three scarves in my head right now. There is no reasoning with myself that this is seed linen stitch and it should be boring the pants off of me. Somehow it is not boring. Somehow I want to rip through my stash and find all the contrasting colors that I can find and make 20 of these for all my closest friends. See? I’m Smitten. The trick to this scarf is that there. Is. No. Purl. Row. I know! It seems wrong. You start every row on the right side with a 8″ tail and then cut your yarn at the end of the row, leaving a long tail. I’m tying the yarn as I go so that I’ll have fringe. Who wouldn’t want fringe on their scarf? Especially when the payout is this good. Yep, I’m totally over the top Smitten.